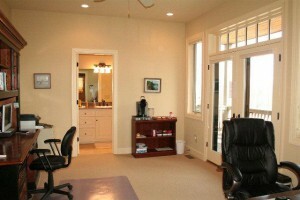 When it comes to Highlands real estate, a home office is attractive to buyers. A home office in a vacation home enables people to spend more time on vacation, even if a little work is involved. Technology enables people to travel more, offering easy access and connectivity almost anywhere. Many home buyers in the Highlands NC area are looking for a place where they can escape yet remain plugged in at the same time. If you are considering selling your Highlands home consider adding a home office or helping a room like a den serve multiple purposes. A home office can have a desk, built-in shelving, and should definitely have wiring for internet access. The more comfortable and useful a home office appears the more appealing it will be to a buyer. Contact me, Lynn Kimball today for more information on real estate in Highlands. I welcome the opportunity to update you on current market trends and help you with all of your buying and selling needs. I know Highlands NC and I know Highlands real estate. Click here to read “20 Ways to Add Value to Your Home” from HGTV.